After the failed abortion that was Rocky V, Balboa was a pleasant surprise to many fans. In the time between Rocky IV and now, Balboa’s lost everything: his money, his wife, his ability to fight. Even his relationship with his son–who is desperately trying to get out his famous father’s shadow–has suffered. Rocky is now in his mid-to-late 50’s and he’s settled into obscurity, running a small restaurant in Philadelphia which he named after his late wife. His brain damage, with which he was diagnosed in Rocky V and something that wasn’t explicitly addressed in the film, wasn’t as bad as it was made to seem. By today’s standards, all contact athletes have some form of brain trauma. However, a post-Rocky IV Balboa would have been cleared for more fights. Understandably, the questions of “what could have been” have been eating away at him all these years. A computer simulation match featuring The Italian Stallion in his prime and the current champion, Mason “The Line” Dixon, shows Rocky would have won decisively. Balboa now feels like he has some more fighting left to do and applies for a boxing license, for which he is initially denied. After an impassioned speech, the athletic commission grants him the license. Mason’s camp sees this as a great opportunity to buy some good will for the champ. Dixon, who’s been a decent champion during a time of unworthy contenders, never won the love of the people the way Rocky or even Apollo had. Because he’d never been tested by any of his opponents, the fans questioned his heart. Rocky gets approached with the offer, but he’s hesitant; he just wanted to take on some local opponents. When Balboa gets offered the chance to go against the champ, even in an exhibition match, he doesn’t feel like he should be taking on a challenge of this magnitude anymore. He’s also worried about what his son, who has already expressed concerns Rocky’s return to the ring, and others are going to think. The Lesson: Rocky is suffering from Imposter Syndrome. Even though he’d achieved great success in the past, his best days are behind him. He would have been completely fine boxing small time fighters and didn’t think he was worthy of being offered a fight with the champion. Getting a pep talk from Marie, who was briefly introduced as a wayward teen in the original Rocky and is now older and wiser, she reminds him of who he is: a fighter. This was to be his last chance to recapture what he felt when fighting in his prime; it was now or never. If you’re reading this, you’re probably not 60 years old. But there is something you want to do that you keep putting off until tomorrow. You don’t think you can do it. You don’t think you deserve it. But if you don’t do it now, one day you’ll look and realize that there aren’t a lot of tomorrow’s left. Are you a fighter? Then get out there and fight. He accepts the challenge, and shortly after he received an unexpected visit from his son, Robert. 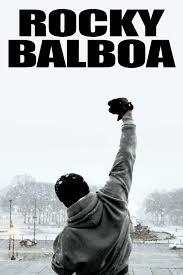 Rocky casts a long shadow, and the media circus around this fight has made things unbearable for the young Balboa. He asks that Rocky quit the fight. Trying to recap Rocky’s response, and possibly my favorite piece of Rocky wisdom, won’t do it justice. I’ve often wondered if this wasn’t, at least in part, directed at Sylvester Stallone’s son, Sage. He, too, wanted to break into the movie business, but always contended with living in the shadow of his incredibly famous father. In many respects, despite being a fictional character, Rocky was a father figure of sorts to many young men who grew up during that time period, and perhaps even more so to those who felt the void of not having a father in their lives. 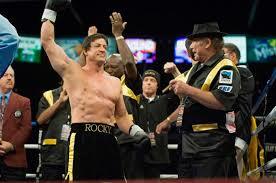 For those of us, like me, who looked up to Rocky and Sylvester Stallone, Sage was almost like a brother. He died about 6 years after the movie, and when I heard the news, it almost felt like losing a brother I never met. Anyone who was aware of the issues between Sage and his father knew how relevant and powerful this scene was. The Lesson: Life isn’t always easy. Life isn’t always fair. But what are you going to do about it? Sometimes life deals you a crappy hand; you’re faced with challenges you can’t escape. Sometimes you can work hard and get better cards; you can work your way out of some bad situations to create better ones. But sometimes, certain things are just out of your control. You can either blame someone or something else for not having the things that you want out of life, or you can play the hand that you’ve been dealt with the best of your abilities while trying to find the things that you can change and address those to create better opportunities for yourself. Rocky acknowledges that he’s no longer a young man. There’s nothing that he can do about it; that’s the card he’s now been dealt. He’s lost his speed, mobility, and agility. In training for his fight with Dixon, he adapts his training to focus on what he can still do: punch. He trades the one-arm push-ups for bench pressing and chasing chickens for Olympic lifting. Detached from the outcome, winning the fight was irrelevant to him; all that mattered is that he took the chance and can continue to live without regrets or questions of what might have been. Now he’s ready to get into the ring for one last time. Everyone expected that this Mason-Dixon would quickly dispatch the aged Balboa. And it wasn’t looking good for him until Dixon breaks his hand on Balboa’s head. Rocky takes advantage of this handicap and wills his way through the full ten rounds. At the end of the fight, before the winner is announced, he leaves the ring, waving his final goodbyes, to both the audience in the arena and to the viewers.